Red Sox Take Game 1 Over Cards: The Boston Red Sox opened the 2013 World Series with an 8-1 home thrashing of the St. Louis Cardinals. Jeff Passan of Yahoo Sports called the game "an infinity-to-one beatdown that showcased the absolute worst in the Cardinals." In one indicator of how the night went, Cards outfielder Carlos Beltran stole a grand slam from David Ortiz and it might be the worst news of the night for St. Louis. He suffered a right rib contusion hitting the wall and left the game. (On local radio in Jacksonville, orthopedic surgeon Kevin Murphy described the cartilage bruise as the kind of injury that will hurt for three months.) David Lennon of Newsday writes, "Beltran had played 22 games at Fenway Park, but Wednesday night was his first in right, where the chest-high bullpen wall can be dangerous to the uninitiated." That was a hell of a game for the Sox; I don't know what more could have gone right for them, and it's clear the bats have forgotten their troubles from the ALCS. The Fox announcers were trying to talk up Wacha like he was the looming Verlander, but I guess they want to believe this will turn into a tight series (it may, but nothing in game 1 is suggesting it). Hell, the Cardinals/Beltran prevented a Papi grand slam with a great catch, like some echo of the failed Hunter attempt in game 2 of the ALCS... and it not only didn't matter, it may have cost them Beltran for the next game, or more. The Fox announcers were trying to talk up Wacha like he was the looming Verlander, but I guess they want to believe this will turn into a tight series (it may, but nothing in game 1 is suggesting it). That 96 World Series was unbelievable. The Braves had been scorching their opponents leading up to the Series and won the first two games on the road at Yankee Stadium. There was no reason to believe that they wouldn't finish off the job heading home to Atlanta for three games. The Series only went six games and by the end of Game 5, the prospect of a Yankees title seemed inevitable. I remember not having any expectation whatsoever that the Braves would win Game 6 heading back to NY. It just felt like a done deal. Amazing momentum shift. No telling what will happen here. But it's hard to picture the Cards not bouncing back and making it a competitive Series. The Yankees were one inning away from a sweep in 2004. I dunno, he looked like the kind of pitcher to give the Sox fits in the bit of the NLCS I saw him pitch. Might be the kind of thing where he beats them in his first start and then they get to him in the second one. And we have our first conspiracy theory of the Series: Jon Lester was using Vaseline and you can tell because there are shots of a giant gob of it that no ump would ever notice but some guy on TV did. And to be fair, TV provides a viewer a much closer inspection of his glove than any umpire would get from 60'6"+ away (unless he specifically asks to see it).
" Ohhhhh, that's why Kozma couldn't catch the ball....it was slippery. That explains everything!!!! " The dual hanging heads at the end of that gif is perfect. Sure, if we first accept that a gob of Vaseline on a black baseball glove would appear as yellow instead of clear and that any player in their right mind would go out in World Series Game One with something so obvious in the era of HDTV. I feel that also requires us to accept he's been doing it all season without anyone catching on in spite of the Jays' pursuit of Buchholz. In some ways, I think a drubbing like that may be easier to bounce back from than a close loss turning on a bad play, a walk-off, or something of that nature. It also stands to mention that the Cardinals obviously did themselves no favors; it's not like they ran into a juggernaut that just dominated every phase of the game -- they committed 3 errors (including one that could have potentially gotten them out of the first with no runs allowed), left quite a few opportunities on the table (bases loaded with one out, second and third with two outs), etc. But the Red Sox obviously acquitted themselves quite well, and Cardinals pitchers are going to have to think about their approach vs a line-up that is obviously willing to be patient and work counts. Still think this one will go 6 or 7. The color doesn't look very yellow to me in the photo the Cards minor league pitcher tweeted. That would be such an enormous risk to take it's hard to imagine him doing it. Vaseline mixed with pine tar? Dirt from the ball (two-way transfer)? And the vaseline we use on our baby isn't clear by any means. Also, if you're going to give yourself an advantage, I'd have to believe a World Series game would be high on my list of probable times to try. Finally, it's inside the glove so maybe he doesn't think anyone can see it regardless of the existence of HDTV. Just why does he touch his glove in that exact spot (where the discoloured substance was located) with only those two pitching fingers (the ones that rest on top of the ball and impart the spin)? It's not the same as touching your hat to adjust it before every pitch. Or wiping your fingers across your pant leg to dry them off. Anyone remember Kenny Rogers in Game 2 of the 2006 World Series? Discussed in length here in your obligatory trip to the SpoFi archives. For the record, I doubt anything was amiss with Lester. I didn't see last night's game. What I'd like to see is video of the Cards at bats. Rarely have I ever seen an inning of baseball where a ball has not been fouled off, bounced in the dirt, or simply been exchanged for other reasons between the home plate umpire and catcher. Umpires also know the flight patterns of pitches .. these guys see over 200 pitches every night of the year. Surely the umpire knows if a ball has been doctored. Here's another photo of the smudge on Lester's glove. Would it be legal (or helpful) to rub dirt into your glove and get some of that on your fingers before a pitch? More photos and GIFs, including one where Lester adjusts his hat while avoiding touching it with his index finger. This is a photo of Lester pitching as of September 28th. No weird green spot. I dunno - I have no explanation for what it is (maybe his glove has some kind of structural defect they fixed with glue? ), but doesn't it seem risky to introduce a foreign substance in game one of the World Series? Not just for the risk of getting caught, but if it adds spin or movement, you're going to have to locate your pitches in a whole new way. Just seems like a lot of risk for a guy who's never had this accusation (as far as I remember) before. Here's the vertical movement on his pitches over the last 3 years. None of the numbers for last night (at the bottom) seem like outliers. The horizontal data is there as well in the left-hand menu. Here's last night's game charted. I have no idea what to look for in either of those. Well, have you watched him pitch? I don't think the comparisons to Verlander are misplaced at all. I can see the Red Sox making him throw strikes and wearing him down, but they've been shut down by dominant pitching before, so that would come as no great shock. I guess. You're also taking a huge risk if caught. I'm not a pitching expert, but I didn't see any balls break drastically, and pitch charts seem to back that up. I'm also surprised at how the cardinals reacted to the overturned call. I understand being upset, but from what I've read they almost seem to insinuate it shouldn't have been overturned. This wasn't a borderline call. And though it's disappointing, I can't imagine anyone not believing getting the call right is more important. Even Wainwright, the one Cardinal who was actually willing to concede that "I think they probably made the right call there," smiled sheepishly when he was then asked if he was in favor of seeing the umpires huddle to get calls like that right. The 'one' cardinal? The cardinals should forget about the corrected call and the mystery substance and just play better. They're a good team. I'm sure we'll see that before the series is over. More on the mysterious substance. Jeff Passan says "Of course there is something on his glove and fingers, but everyone knows and no one cares so stop talking about it." I found "The Blowout That Wasn't" an interesting read though I tend to agree with the first comment which suggests the trends the author identifies are overstated due to the number of innings played with the game seemingly out of hand. That said, it still pours cold water on any Sox fan's over-confidence. they sucked at getting hits in big situations while the Red Sox managed to come up with big hits when they mattered most. It was obvious the Red Sox were helped by cardinal errors, and the Sox only outhit them by 1, but that statement was also true during the Tigers series. Ortiz and Victorino had big hits when they needed them, and the Tigers did not. I know, clutch hitting doesn't really exist, but they've been riding what's seemed like clutch hitting for a while now. I'm also surprised at how the cardinals reacted to the overturned call. I understand being upset, but from what I've read they almost seem to insinuate it shouldn't have been overturned. The reaction by Mike Matheny is understandable if one considers the "old school" of umpiring. Matheny just didn't think they would consult and overturn. It used to be that calls, even those that were terribly bad and blatantly obvious, were just not overturned. No umpire would overrule a brother umpire on the field, although there would be plenty of discussion in the dressing room after the game. But that was in the days before high definition, ultra-slow-motion, stop action video with long lenses and multiple camera angles. A bad call in today's game is very hard to hide, although those that are incorrect but very close can be explained away and are usually accepted as part of the game. Back in the day the umpire could make his call and stand by it, knowing that there would be few, if any, legitimate criticisms from the fandom. In the case of the dropped throw, the call was obviously bad. The reason has been put forward as the umpire, Dana DeMuth, looking at the contact of the shortstop's foot with the base and not looking at the ball. This is a real possibility, and if so, DeMuth never saw the initial contact of the ball with the glove and merely assumed that there had been a catch. If this is the case, it was a single occurrence bad mechanics, not a bad umpire blowing a call. Even Cardinals fans should admit, begrudgingly I'm sure, that getting the call right was the thing to do. They're a good team. I'm sure we'll see that before the series is over. This Boston fan looks upon game 1 as aberrant. I do not expect St. Louis to give away outs as if they were candy on October 31. Whether or not Wacha will be the stopper remains to be seen, but Red Sox batters can do real damage if all you have to offer is a fast ball with little movement. From what I've seen of him, Wacha is a lot better than this, but we will see. The weather is predicted to be cold with wind from the WNW at 4 mph, gusting to 12 mph. That puts the wind blowing out to right field, but not terribly hard unless one's hit coincides with a gust. It shouldn't favor either team. As for the rest of the series, it comes down to the second-level starters on both sides for games 3 & 4, with the possible scratch of Clay Buchholz due to some "shoulder stiffness". In that case Felix DuBront would be pressed into service. The schedule is such that Lester and Wainwright would be available to pitch Game 5 on 4-days rest. I don't hear any fat lady clearing her throat, so my fingernails will remain well-bitten until the final out. Red Sox fans (and players) know very, very well that the direction a series is going can change completely in one game (or one inning... or even one at-bat). People counting their chickens before they hatch right now are not choosing wisely. 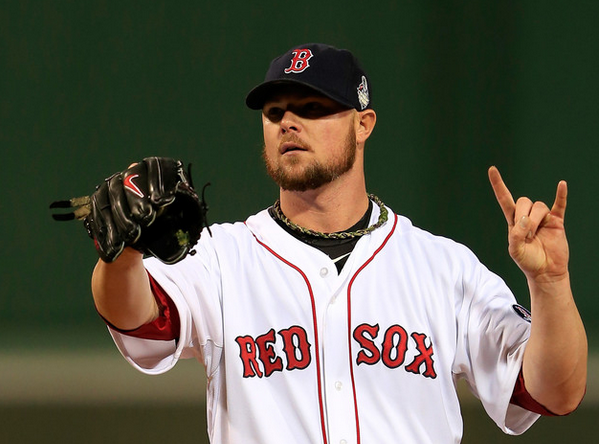 Lester should consider selling advertising on the inside of his glove for his next start. I don't think anyone's counting their chickens, but I stand by the fact that game 1 went literally as well as could be hoped for the Sox, and despite the low OBP noted in yerfatma's link the bats are getting keyed in. Joe Buck is a known STL homer as well as a Fox employee vested in this being a tight, gritty series like the ALCS. Hence his repeated comments throughout the game about the upcoming Wacha matchup, when we're not talking about Pedro in his prime. Wacha could throw a no-no tonight, and I'm certainly not assuming any game is a guarantee for either team (as you say, we know best that a series isn't won until the final out of the 4th win), but if you're a Sox fan like me, this series has started off very well, and I don't think the Sox are facing anywhere the same level of pitching as they just squeaked by last week. The reaction by Mike Matheny is understandable if one considers the "old school" of umpiring. Matheny just didn't think they would consult and overturn. It used to be that calls, even those that were terribly bad and blatantly obvious, were just not overturned. Yeah, I understand this point of view, and have read it, and I disagree with it. Matheny is young manager, and with replays coming very soon, it shouldn't come as a surprise that the umpires in a WS game are going to do anything to get the call right. I'm not saying Matheny should be happy at the call. But I would think he would be more along the line of "it was tough to take the overturned call, but getting the call right is the most important thing", and that's not really what I heard. Maybe I'm projecting, but I'm not sure I'd be happy to win with such a bad call. For what it's worth, I read over a Cardinal blog during that play and even with Cardinal fans they A. Thought it was a horrible call. B. Didn't have much of a problem having it over turned. If this had been a judgment call, I might agree more with Matheny, an umpire calling a runner safe on a double play because the fielder turning the play wasn't on the bag. The neighborhood call is given all season long, so why start calling it in the WS? But this wasn't a judgment call. It wasn't 'was it in his glove long enough'. It was a flat out miss. He never caught the ball. This isn't the first time umpires have gathered to correct a post season bad call by one of their colleagues, as most Red Sox fans probably remember. if you're a Sox fan like me, this series has started off very well, and I don't think the Sox are facing anywhere the same level of pitching as they just squeaked by last week. Oh, yes, this I agree with 100%. I don't think the Sox are facing anywhere the same level of pitching as they just squeaked by last week. I am a Sox fan like you and now I know who to blame if this all goes pear-shaped.